SUQQU Shimmer Liquid Blush is new for SS2019. As of Feb 2019, there are only 3 colors. Note: You should NOT push completely! Half of the quantity is pretty enough for both of your cheeks. A drop is very enough. Guess my gooseflesh skin (it is mild as wearing long sleeves, but when I rolled my sleeves up, it was a little bit cold, if you know Japanese houses, it is set for being cool in summer), you may be able to guess the size of the drops. When it was spread on my face, it is slightly and nice. #01 and #03 are not good lasting on my face, but in #02, this color is QUITE good lasting, see this picture below. 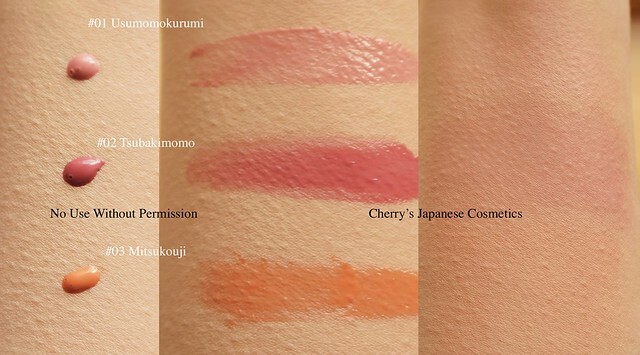 In this picture, I took a picture to show the swatch, on this version, I dropped the liquid blushes too much, and decided not to use this article. I used Awake Makeup remover to removing. The “Milky Day” makeup remover is a cleansing milk, it is mild to removing my makeups. Guess it could removed #01 and #03, but could not #02. I like this liquid blush pretty much because there are no wired perfume, this is the very SUQQU makeup products! 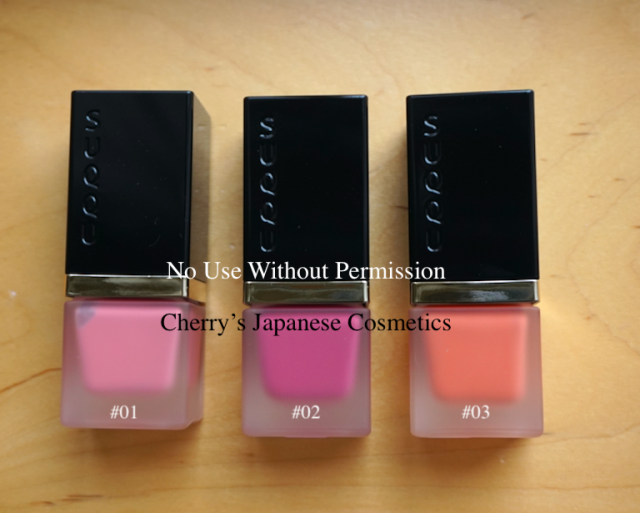 And I had used THREE liquid blushes, but these the lip gloss style or the nail lacquer style liquid blushes are not quite good hygienic, I often wipe just after my applying. It means, as you know, the products are used up pretty soon! Guess more than half are wiped away!! But this SUQQU Shimmer Liquid Blush is pump style, I admit it is not pretty easy to use to get one drop only on your finger, but it is better for the hygiene, and you can use this without wiping away!